The role and impact of public opinion in shaping U.S. foreign policy continues to be debated. As noted by Holsti (1996: 33), “the most important reason for interest in public opinion on foreign affairs arises from the assumption that in some ways and at least some of the time public attitudes have an impact, for better or worse, on the conduct of the nation’s external policy.” The academic literature suggests that there are limits on public opinion’s importance, with an exception for “intermestic” issues (such as trade) or issues that interest a group of active citizens who feel intensely about an issue (such as U.S. support for Israel, Greece over Turkey, or the continuation of the embargo against Castro’s Cuba). Academic reviews of American public opinion also have established that, while public opinion, especially in the foreign policy arena, is subject to sudden shifts, it is more stable and less volatile than perceived by the “conventional wisdom.” The academic literature on policy-making also shows that elected officials, in particular, anticipate how their acts (or their failure to act) affect the views of their constituents as to the officials’ performance. This paper examines the linkage between public opinion and policymakers, applying what we know about both public opinion and decision-making to the issue of Cuba. This paper is driven by one overarching question: Why in February 1996 did those who opposed Helms-Burton, including the President and a number of political allies in Congress (on the issue of Cuba) respond as they did to the shootdown? Specifically, if public opinion is latent to an extent that it provides freedom to maneuver for policymakers in foreign policy, if elite opinion was in favor of doing the opposite of the President’s acquiescence to Helms-Burton—and this opinion pre-dated and was not changed by the shootdown—and if the President is in a position to lead public opinion on a foreign policy issue, then why the result that occurred? Is there a “Cuba exception” to the analysis that American public opinion is latent or stable? Cuba has been part of the American media, public, and political landscape for nearly 100 years. In 1898, the power of William Randolph Hearst is credited with initiating American interest in Cuba. In 1957, the New York Times brought to American public attention a bearded guerrilla named Fidel Castro. In 1961, the United States sponsored a failed invasion at the Bay of Pigs in an attempt to remove that same revolutionary from power. In 1962, Cuba was central to the one time when the United States and the Soviet Union actually teetered on the brink of a nuclear exchange. In 1972, Cuban émigrés were arrested in the Watergate complex burglarizing the Democratic National Headquarters on behalf of the Nixon White House. In 1980, in the space of five months, 125,000 Cubans fled their homeland for the United States, contributing to the electoral defeat of both a President and a young southern governor who would face his own Cuba immigration policy dilemma as President 15 years later. By February 1996, the U.S.- Cuban relationship was the most unpredictably predictable relationship one could imagine. A further dimension to the relationship is the presence of an ethnic community that is concentrated in two key electoral states and that has mobilized the instruments of the American political system in a manner worthy of the best political operatives in recent memory. Because of its continuing concern to the U.S. public and policymakers, U.S. policy towards Cuba offers an opportunity to investigate how public opinion has helped shape, or has been shaped by, policy and to analyze the role that the media plays in this process. Unlike studies of public opinion on Central America or South Africa, “Cuba” is an issue that has been on the political and public agenda for 40 years. This 40- year history of public opinion data provides a unique opportunity to analyze the vicissitudes of public opinion over a significant period of time, while the period immediately before and after the 1996 shootdown offers a case study on the role and impact of elite opinion on policymaking during a period of heightened tensions. After reviewing the literature in this area, I explore the question of whether there is stability, structure, and coherence in public opinion towards Cuba and what, if any, control public opinion exerts over foreign policymaking by analyzing public opinion polls over a period of nearly forty years and then focusing in on the roles and reactions of the public, the media, and policymakers in the most recent significant event that triggered a rekindling of public opinion on the issue of Cuba. The questions of whether and how public opinion influences policy-making, especially foreign policymaking, have puzzled political observers for almost fifty years. One of the earliest investigations into American public attitudes found a “mass immunity” to foreign policy because that type of information “has no immediate utility or meaning” for the vast majority of citizens (Almond, 1950: 230-32). The reason for this immunity is that “Americans tend to exhaust their emotional and intellectual energies in private pursuits,” not in thinking about foreign policy. As a result, the public “tend[s] to react [to foreign policy issues] in formless and plastic moods which undergo frequent alterations” (53). Almond concluded that public control over foreign policy was nearly impossible. Public indifference, except in the case of “dramatic or overtly threatening events,” and the “pull of domestic and private affairs” (72) result in the public “follow[ing] the lead of policy elites if they demonstrate unity and resolve” (142). This “permissive” mood, however, is also capable of thrusting “the reassertion of the primacy of private and domestic values” into center attention at a time when it may be dangerous and misguided to do so (88, 106). Hence, U.S. foreign policy is subject to the “mood” of the American people at any given moment. Almond’s conclusions were reinforced by James Rosenau who concluded that the mass public’s “response to foreign policy matters is less one of intellect and more one of emotion” (1961: 35). What concerned Rosenau was that this uninformed state of affairs resulted in a mass public that is “impulsive, unstable, unreasoning, unpredictable, [and] capable of suddenly shifting direction or of going in several contradictory directions at the same time” (36). Almond’s and Rosenau’s findings dominated the early “conventional wisdom,” and their conclusions could be found in the attitudes of the foreign policy elite towards the general public. As one Foreign Service Officer exclaimed to an academic interviewer about the influence of public opinion, “To hell with public opinion. … We should lead, and not follow” (Cohen, 1973: 62). The Almond and Rosenau inquiries raised two questions: First, does public opinion have an underlying structure and coherence? Second, what, if any, influence does public opinion exert over foreign policy making? More recent research has found public opinion on foreign policy to be structured, but with a structure “distinctive to the foreign-policy domain” (Hurwitz and Peffley, 1987: 1114). Hurwitz and Peffley concluded that, on foreign policy questions, individuals use judgmental shortcuts “to cope with an extraordinarily confusing world (with limited resources to pay information costs) by structuring views about specific foreign policies according to their more general and abstract beliefs” (1114). They found that the core values of “ethnocentrism” (belief that the United States is superior to other nations) and “morality of warfare” (belief in the “rightness” of military action) structure general postures on “militarism” (belief about the assertiveness of foreign policy), “anticommunism” (belief about the appropriate posture of the United States toward Communist nations), and “isolationism” (belief about the desirability of the United States avoiding ties with other nations) (1107-9). These general postures are “important determinants of individuals’ preferences across a wide range of specific activities…” (1114). On the question of the stability of public opinion, the “conventional wisdom” held public attitudes to be subject to capricious change. Recent scholarship, however, refutes this conclusion and questions whether it has ever been the case in the post-World War II context (Shapiro and Page, 1988; Page and Shapiro, 1992). Reviewing 50 years of public opinion on a range of policy issues, Page and Shapiro (1992: 45) found “a remarkable degree of stability in Americans’ collective policy preferences, clearly contradicting any claim of frequent changes or wild fluctuations in public opinion.” They do not argue that public opinion cannot change capriciously or abruptly. In the foreign policy area, in particular, they found abrupt movements of opinion. But most of these were “understandable responses to sudden events” (66). They conclude that “the collective policy preferences of Americans have been quite stable” and that “collective public opinion on a given issue at one moment in time is a very strong predictor of opinion on that same issue at a later time” (65). The second question prompted by Almond and Rosenau is that of the extent of public opinion control over the policy-making process. As noted earlier, Almond did not see much possibility for the public to direct foreign policy. Rosenau was equally skeptical, seeing the public as more a negative check than a positive contributor to the process. His notion was that the public set the boundaries within which policy was made: “through the potentiality of its more active moods, [the public sets] the outer limits within which decision-makers and opinion-makers feel constrained to operate and interact” (36). Cohen (1973) was even more dismissive of any direct effects of public opinion on foreign policy-making. What seems to be missing in the literature on public opinion is the answer to the puzzle of why politicians seem to act as if their foreign policy decisions will provoke an adverse public reaction. In current times, this is known as the “CNN effect”: “the nexus of media power and foreign policy, where television’s instantly transmitted images fire public opinion, demanding instant responses from government officials, shaping and reshaping foreign policy at the whim of electrons” (Strobel, 1999: 85). “Legislators worry constantly about the electoral consequences of their decisions” and they “regularly attempt to anticipate how specific roll-call votes might be used against them and regularly adjust their votes in ways designed to forestall electoral problems” (Arnold, 1990: 9). In attempting to anticipate the impact of any decision, members recognize that there are “those citizens who are aware that a specific issue is on the congressional agenda, know what alternatives are under consideration, and have relatively firm preferences about what Congress should do” (attentive publics). And there are those “inattentive publics… who have neither firm policy preferences about an issue nor knowledge of what Congress is considering” (64-5). The problem is exactly the same as described by the literature on latent public opinion: “Legislators ignore inattentive publics at their peril … Inattentiveness and lack of information today should not be confused with indifference tomorrow” (68). The result is that “legislators must imagine what preferences might arise in the future and estimate how those preferences might affect [inattentive] citizens’ electoral decisions” (65). In an effort to divine what public opinion is—or is likely to be—Members of Congress rely on the views and reactions of colleagues (Kingdon, 1989), the elite media (Cohen, 1963; Kingdon, 1989), local media, and constituent calls and letters (Kingdon, 1989). They also factor in how they have voted in the past, the reactions to those votes, and benefits of consistency versus “flip-flopping” (Fenno, 1978). Presidents use polls, amongst other criteria, in an attempt to gauge public opinion (e.g., Hinckley, 1992; Kernell, 1997). In this process, many politicians factor in, or perhaps develop, an “instinct” for where the public is on any given issue. The belief that public attitudes are subject to “capricious change” (which was the “conventional wisdom” for much of the Cold War period) has largely been laid to rest by recent scholarship, most notably the works of Page and Shapiro (1988 and 1992). Reviewing 50 years of public opinion on a spectrum of policy issues, Page and Shapiro (1992: 45) found “a remarkable degree of stability in Americans’ collective policy preferences, clearly contradicting any claim of frequent changes or wild fluctuations in public opinion.” They do not argue that public opinion does not change capriciously or cannot change abruptly. In the foreign policy area, in particular, they found abrupt movements of opinion. But most of these were “understandable responses to sudden events” (66). They concluded that “the collective policy preferences of Americans have been quite stable” and that “collective public opinion on a given issue at one moment in time is a very strong predictor of opinion on that same issue at a later time” (65). As one piece of evidence for opinion stability in foreign policy, Page and Shapiro make reference to the change in public attitudes towards U.S. relations with Cuba in the 1970s, specifically public opinion from 1973 until 1978. Page and Shapiro’s reference to Cuba prompted the question of whether the stability they found in the 1970s is representative of the history of the U.S.-Cuban relationship since 1959, when the Castro government came to power. My first hypothesis is that Cuba will be an exception to Page and Shapiro’s conclusion of a stable public opinion. In other words, volatility is to be expected given the volatility of the relationship. Page and Shapiro looked at roughly one-fourth of the U.S.-Cuban relationship, not counting the years since their study’s publication. Does a review of nearly 40 years, as opposed to the six years studied by Page and Shapiro, bear out their conclusion? Are there understandable explanations for any swings in public opinion and, then, did those attitude changes stabilize? The second question goes to who moves public opinion or who can present an obstacle to opinion moving. Inquiries into public attitudes, especially those on foreign policy issues, conclude that “public opinion becomes a ‘barking dog’ when an issue produces a debate among elites that is covered by the media in such a way as to focus the public’s attention” (Powlick and Katz, 1998: 31). Cohen observed that “the external world, the world of foreign policy, reaches us [the public] … via the media of mass communication… For most of the foreign policy audience, the really effective political map of the world—that is to say, their operational map of the world—is drawn by the reporter and the editor, not by the cartographer” (1963 13). My second hypothesis is that on the issue of Cuba, where there is a long-term history impacting the American political landscape, policymakers will respond to their perceptions of mass public opinion and not on elite opinion. In other words, elite opinion is not perceived to provide “adequate political cover” when a policymaker anticipates that an act or a failure to act will result in a negative public view of his/her course, be it a vote in Congress or a specific presidential policy. I test this hypothesis by reviewing, first, elite opinion as reflected by newspaper editorials, including those carried in the New York Times, Washington Post, and other “national newspapers” (USA Today, Wall Street Journal, and the Journal of Commerce) and editorials of local papers. For the first hypothesis, I followed Page and Shapiro’s methodology of gathering “all published or otherwise available surveys of the American public’s policy preferences” on Cuba between January 1959 and May 1999. This involved review of some 600 individual questions3 and two comprehensive, Cubaspecific surveys. The first survey question I found on either Cuba or Castro was from May 1960. The most recent appearance of “Cuba” as a survey topic occurred in a May 1999 Gallup poll. I reviewed these survey questions in two ways: first, chronologically, reviewing all the questions by decade (e.g., sixties, seventies, etc.) to get a feel of the issues and overall opinion. Second, I matched them by topic or referent (e.g., diplomatic normalization questions, how do you feel about Castro questions, immigration questions, etc.) While my focus is public opinion leading up to and during the February 1996 shootdown and the U.S. response (including the President’s signing of the so-called “Helms-Burton” Act on March 12, 1996), I looked at survey questions since that time. The second question involved three inquiries: the amount of news coverage on Cuba during the 1995- 6 period, the extent and substance of elite opinion on Cuba, and the importance of this elite opinion on policymakers. To evaluate the amount of news coverage, I focused on the coverage given Cuba during the February 8, 1995 through March 25, 1996 period in the 44 “major newspapers” surveyed by LEXISNEXIS. For “elite opinion,” I focused on newspaper editorials, surveying all newspaper editorials for the period February 8, 1995 through March 25, 1996 for the 119 U.S. papers covered by LEXIS-NEXIS. And on making judgments about the importance of the “elite media” (Lichter, Rothman, Lichter, 1986) on policymakers, I interviewed U.S. government officials and interest group activists involved in Cuba policy during the period of Helms-Burton’s consideration. Editorials are a forum in which the newspaper as an institution expresses views and preferences and attempts to influence public and policymaker opinion. 4 My search resulted in a total of 370 editorials in which Cuba was mentioned during the February 1995-March 1996 time-frame. Of this number, 342 editorials dealt with some aspect of broader U.S. policy, meaning that I removed from the sample those editorials which dealt with an issue that was not related to the larger question of the U.S. relationship with Cuba. Newspaper editorials both reflect and attempt to lead public opinion. The relative influence of the public on editorial writers and vice versa may depend upon the issues involved, the context of their discussion, the general attitudes of the readers, and the prestige of the newspaper. Usually editorial pages appeal only to the attentive public… The influence of editorials, however, may extend beyond initial readership through the process of opinion leadership. These observations track with my own experience on Capitol Hill. Members do want to know what their constituents, including their local newspapers, are saying, even when the newspaper is deemed hostile to that member. Members will spend time cultivating editorial boards or working to minimize the influence of local editorials. Also, members do pay attention to what local editorials argue. It is quite common for a press assistant or the staff member with the substantive policy responsibility to have land on his/ her desk an editorial with “is this right?” or “we need to respond” written across the top. This occurs especially when the editorial addresses an issue on which the member is the author or cosponsor of legislation or is a leading proponent/opponent of legislation or a policy. While the causal link between a policymaker’s decision and an editorial remains an open question, this does not mean that editorials are not influential. From February 8, 1995 to February 24, 1996, there were 210 relevant editorials on Cuba. Between February 25, 1996 and March 25, 1996 (post-shootdown), there were 132 editorials on Cuba. All 342 editorials were reviewed by three coders, who were asked to rate them on whether they supported the current policy or its tightening/strengthening or opposed U.S. policy toward Cuba. Of the 210 editorials prior to February 24, 1996 (the day of the shootdown), all three coders agreed on all but 19 editorials, for an intercoder reliability rate of 91 percent. Of the 19, if two of the three coders agreed, it was included in the sample; this happened in all 19 cases. Of the 132 editorials after the shootdown (2/25/96- 3/25/96), the coders had an 87 percent agreement on all 132. There were 17 editorials upon which there was agreement by two of the three coders. Included in this 17 are seven editorials that expressed support of the embargo generally, but opposed any tightening by enactment of the Helms-Burton legislation; these 17 remained in the sample. When Fidel Castro marched into power in January 1959, it is clear that the Cuban people cheered his arrival and the fall of the Batista regime. We do not know what the American public thought of this event as there are no polls to tell us. Nor do we know what the public thought of this bearded revolutionary in fatigues when in April of that year he visited the United States, where he met with then-Vice President Richard M. Nixon. We know what Nixon thought both at the time and later: at the time, he “seemed remarkably sympathetic to Castro” (Rabe, 1988: 124); four years later, he wrote that after his meeting with Castro he urged Eisenhower to reject the State Department’s recommendation to get along with the Cuban (Nixon, 1962: 352). The first survey of American attitudes toward Cuba was taken in May 1960, when Americans were asked to rate Castro on a “feeling thermometer” ranging from +5 (“someone you like very much”) to –5 (“someone you dislike very much”): 53 percent of the respondents rated Castro at –5. (In all, 72 percent rated Castro on the “minus” side of the scale (Gallup, May 31, 1960: USGALLUP .60-628.R029C). By this time, Castro had started his expropriation of property, including U.S.-owned properties, consolidated power by purging liberal elements from his coalition, and signed a commercial agreement with the Soviet Union. Consistently throughout the 1960s, Cuba registered on the general issue question: “of the many problems which this country has, which one gives you the greatest worry or concern at this time?” Responses to this question ranged from less than .5 percent to a high of 37 percent in November 1962, a month after the Cuban Missile Crisis was resolved. (In this same survey, 49 percent expressed approval for Kennedy’s “handling of the Cuban situation” (Gallup, November 21, 1962: GALLUP .62-665.R002). Not surprisingly, given the events of the Fall of 1962, when asked in early 1963 if they thought Cuba was “a serious threat to world peace,” 60 percent responded affirmatively (and 29 percent said “no”). But 63 percent still disagreed with direct U.S. intervention to remove Castro; 20 percent agreed with the idea of the U.S. military helping to overthrow the regime (Gallup, February 12, 1963: USGALLUP .63- 668.R005A). Also throughout the 1960s, Castro provoked a strong “dislike” from the American public. Gallup used the +5 to –5 feeling thermometer throughout the decade. 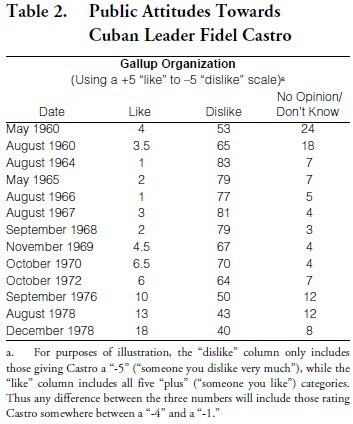 The percentage of those expressing a –5 “dislike very much” feeling for the Cuban leader hit a high of 83 percent in May 1964, with a total of 92 percent expressing a “dislike” opinion, 7 percent saying they had no opinion or did not know the person, and the remaining one percent expressing some positive feeling (Gallup, May 27, 1964: USGALLUP .64- 691.R33B). Castro ended the decade with a worse U.S. public perception than he had started with: 67 percent rated him a –5 and four percent still found him to be someone they like very much (he had earned the same “like” percentage in May 1960) (Gallup, November 4, 1969: USGALLUP .792- .Q005A). The early to mid-1970s saw a thawing of Cold War relations between Washington and Moscow, the U.S. opening to China (1972), and the end of U.S. military involvement in Vietnam. Led by Nixon with impeccable “Cold Warrior” credentials, this détente in East-West relations affected public and official opinion towards Cuba. In 1973, the United States and Cuba agreed to cooperate to curb hijackings (see Sullivan, 1997). These policy initiatives impacted U.S. attitudes toward Castro, Cuba, and the U.S.-Cuban relationship. The 1970s opened with public opinion continuing to “dislike” Castro, but with the number of respondents expressing some positive attitudes increasing as the decade progressed. Attitudes went from a 75 percent majority strongly expressing a dislike (-5) of the Cuban leader (and a continuing 92 percent in the “minus”/”dislike” column) in January 1970 to a 40 percent plurality in December 1978. Overall, 74 percent expressed a dislike for Castro in 1978, with the remaining 18 percent expressing some positive attitudes towards him. As for feelings towards “Cuba” (as opposed to its leader), in February 1979, respondents still expressed “unfavorable” feelings, but the distribution covered a wider range: a plurality – 22 percent – rated Cuba a “-5,” while 16 percent felt unfavorable at “-1” and 27 percent expressed some degree of a favorable view of that nation. By the end of the decade, public feelings towards “Cuba” (measured by a 100 degree feeling thermometer) found 62 percent expressing opinions in the 50 degrees and below range; only 11 percent reported any “warm” feelings towards Cuba. More significantly than public attitudes towards Castro or Cuba were attitudes towards the U.S.-Cuban relationship. As the decade opened, Americans continued to express opposition to any kind of trade relationship, including an exception for the importation of Cuban cigars. In January 1971, Harris found that 62 percent opposed such an exception and 22 percent favored it (Louis Harris and Associates, January 1971: Harris Survey, USHARRIS.71JAN.R18). But, by 1974, a plurality (43 percent) expressed support for such sales, with 38 percent opposed and 19 percent “not sure” (Harris Survey, December 16, 1974: USHARRIS.121674.R2). The change in U.S.-Soviet and U.S.-China relations resulted in majorities consistently expressing support for the establishment of diplomatic relations between the United States and Cuba. This approval for establishing diplomatic relations first registers in 1973, with 51 percent favoring such a relationship to 33 percent opposed. Of interest was a February 1973 Gallup question, prefaced with a reference to Kissinger’s trip to China, asking respondents if they would favor or oppose “President Nixon sending Henry Kissinger to Cuba to try to improve our relations with that country”: 71 percent favored such a move; 19 percent opposed it, and 10 percent had no opinion (Gallup, February 19, 1973: USGALLUP. 864.Q011). But this support for a diplomatic relationship also depended on how the question was asked and whether what was happening at the time was apparent to the respondent. A CBS News/New York Times’ question tied the “breaking off [of] diplomatic and trade talks with Cuba until Cuba pulls out of Africa.” On this question, 57 percent favored such a hiatus in talks and 27 percent opposed any break conditioned on Cuba’s withdrawal from Africa (June 23, 1978, USCBSNYT.062978.R19D). The preceding question in the same survey had simply asked, “do you approve or disapprove of reestablishing diplomatic and trade relations with Cuba?” Fifty-five percent approved and 29 percent opposed (USCBSNYT. 062978.R18). In late 1978 and early 1979, the dynamic in the U.S.-Soviet and the U.S.-Cuban relationships began to change. Cuban military activities in Africa and the public confirmation that a Soviet combat brigade was in Cuba, combined with political turmoil in the Caribbean and Central America that was supported, if not assisted, by Havana, brought Cuba back into public focus. The focus, however, was not strictly a foreign policy one: a prospective challenger to President Carter for the Democratic presidential nomination, Senator Frank Church (D-Idaho), Chairman of the Senate Foreign Relations Committee, publicly called attention to the Soviet brigade in Cuba. Public opinion supported negotiations with the Russians for the brigade’s withdrawal (83 percent in favor of negotiations in an October 1979 ABC News/Harris survey, October 25, 1979 (USABCHS. 102579.R4B)). But majorities also were critical of the way Carter was dealing with the situation (44 percent disapproval to 40 percent approval in an October 8, 1979 Gallup Poll (USGALLUP. 1140.Q006C); and 46 percent disapproval to 34 percent approval in an October 18, 1979 NBC/ Associate Press poll (USNBCAP.48.R14)). This from a public in which 67 percent claimed to have heard or read something about the Soviet troops in Cuba (NBC News/Associated Press, September 14, 1979 (USNBCAP.45.R10)). This event also impacted public views on U.S.-Cuban diplomatic relations. In the same October 18, 1979 NBC/Associated Press poll, a plurality (44 percent) opposed establishing relations, while 39 percent favored such a move. In a number of ways, public opinion on Cuba during the 1980s offered some interesting twists. A majority expressed support for the U.S. travel and business ban against Cuba (55 percent approving of the ban to 29 percent disapproving)(Audits & Surveys, May 6, 1982 (USAS.18.R08)), with majorities ranging up to 90 percent identifying Cuba as either an “enemy” or “not friendly but not an enemy” of the United States (Harris survey, May 26, 1983; also see, Roper Survey, August 11, 1983), and 76 percent categorizing Cuba as either a “very serious” or “moderately serious” threat to the United States. These patterns remained relatively constant throughout. In both 1983 and 1986, in the Chicago Council on Foreign Relations’ surveys, 48 percent and 53 percent, respectively, favored establishing diplomatic relations. Yet, in January 1988, 56 percent agreed that “all the people of the United States should give their full support” if the Congress and President declared war on Cuba (Market Opinion Research, January 1988), with 37 percent disagreeing and 5 percent saying “it depends” (USMOR.188ATS.R06). What is of note about this last question is that it was asked during a time when no such level of tension existed between the United States and Cuba. The first Cuba-related event of the 1980s occurred between April and September 1980, when some 125,000 Cubans fled the island in the “Mariel boatlift.” The mass exodus was encouraged by the Castro regime, who not only allowed political dissidents to leave, but also used the occasion to empty Cuban prisons and mental institutions. It is not surprising to find “Cuban refugees” appearing on surveys in mid-1980 of “problems facing the country that particularly worry or concern you” (e.g., Time/ Yankelovich, Skelly and White, May 16, 1980, (USYANK.808603.Q02), in which 11 percent of respondents expressed such a concern).7 Yet, Mariel did not impact U.S. public approval of the establishment of diplomatic relations with Havana. The focus on Cuba in the 1980s was on violence and revolution in Central America, an issue which dominated the U.S. foreign policy agenda from 1979 until the late 1980s. From the last year of the Carter Administration to the first year of Bush’s, the countries of El Salvador and Nicaragua received massive U.S. policy and public attention.8 Throughout this debate, the role of Cuba was a topic for policymakers, the media, and pollsters. The Reagan Administration pointed to Cuba as the instigator of much of the region’s troubles. In May 1981, 49 percent of the public expressed the opinion that the “new [Reagan] Administration” was “too soft in its dealings with Cuba.” Thirty-two percent said the Reagan approach was “just about right” (Time/Yankelovich, Skelly and White, May 12, 1981 (USYANK.818607.Q11A4)). But large majorities (73 percent) said the United States should not “secretly try to overthrow” the Cuban Government, despite the fact that 63 percent labeled Cuba “a threat to the security of the United States” (ABC News/Washington Post, March 23, 1982 (USABCWP.51.R33 and .R28)). Between 1977 and 1986, Gallup conducted three surveys for the Chicago Council on Foreign Relations on public attitudes on U.S. foreign policy. 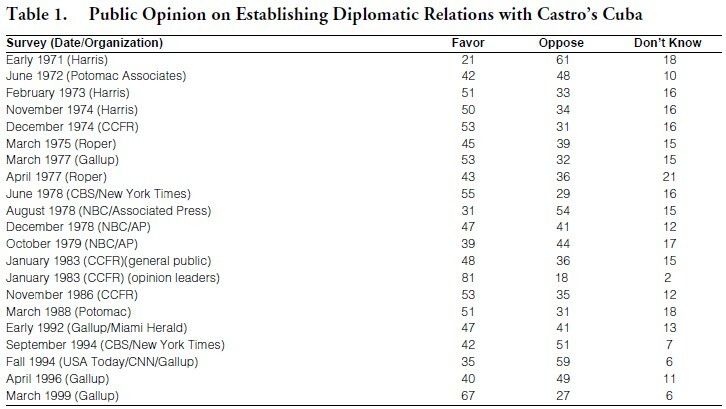 In each of those surveys, respondents were asked about “re-establishing diplomatic and economic relations and exchanging ambassadors” and to respond in terms of “very strongly in favor, fairly strongly in favor, fairly strongly opposed, very strongly opposed, or don’t know.” Despite the rhetoric about the role of Cuba and “another Cuba” in Central America, pluralities, if not majorities, favored normalization of the U.S.-Cuban relationship. There was some drop in “favorable” opinion from a 1977 high of 59 percent to a 1986 level of 53 percent and opposition increased from 25 percent to 35 percent. But a majority still favored normalization five years into the Reagan presidency. As the decade ended, changes in the Soviet Union, especially the ascendancy of Mikhail Gorbachev, altered the opinion of Americans toward that nation.9 There were expectations that “new thinking” in the Soviet Union would be transferred to Cuba, especially when it was announced that Gorbachev and Castro would hold a summit in the Spring of 1989. Prior to the Gorbachev-Castro summit and the fall of the Soviet Union, Gallup conducted a 1988 survey of attitudes towards Cuba among three groups—the general public, a group of opinion leaders, and Cuban- Americans living in New Jersey and Florida. Focusing on the general public, the survey found 51 percent were “very strongly” or “fairly strongly” in favor of establishing diplomatic relations, with 31 percent opposed and 18 percent undecided. The 1990s opened with pluralities continuing to favor the reestablishment of U.S.-Cuban relations and with large majorities dismissing Cuba as a threat to the United States. In a 1992 Gallup poll, reported by the Miami Herald, 47 percent favored restoring diplomatic and economic relations, with 41 percent opposed to such a move (Miami Herald, February 11, 1992: 1B). But by 1994, opinion had returned to its pre-1973 position with a majority (51 percent) now opposing normalization, to 42 percent in favor. In the Fall of 1994, a USA Today/CNN/Gallup poll recorded 59 percent in favor of “limit[ing] diplomatic ties” against 35 percent favoring “expand[ing] diplomatic ties” (USA Today, September 9, 1994: 5A; The Gallup Poll: Public Opinion 1994: 233). Similarly, a Time/CNN poll found 51 percent favoring the continuation of the U.S. embargo against Cuba (with 36 percent opposed), while 64 percent of the same sample favored opening talks with Havana (Time Magazine, September 12, 1994). What happened in 1992-93 to cause a shift in public opinion? The only explanation I can deduce, since there was no dramatic moment in the U.S.-Cuban relationship, is two-fold. First, with the fall of the Soviet Union, there was an expectation that change would come to other nations that held similar philosophies and/or were allied to the Soviet Union, including Cuba. Change did not come to Cuba, at least in 1992. So it is arguable that the general public “wrote off” the Castro regime and was no longer willing to give it the benefit of the doubt in terms of a normalized relationship with the United States. Domestically, the decibel level of the domestic U.S. debate on Cuba increased as a result of that year’s presidential campaign. This is my second guess as to why the change in public attitudes. In 1991-92, the Democrat-controlled Congress attempted to approve legislation titled the Cuban Democracy Act (CDA), sponsored by then-Congressman Robert Torricelli (D-NJ). The Bush Administration objected to various aspects of the legislation and, at one point, Bush vetoed a piece of legislation that contained a Cuba provision sponsored by Florida’s Republican Senator, Connie Mack. In the Spring of 1992, however, presidential candidate Bill Clinton endorsed the CDA, saying “I have read the Torricelli-Graham bill and I like it” (for a discussion of the politics involved, see Vanderbush and Haney, forthcoming). Bush accepted the legislation, including the provision he had previously vetoed, in October 1992 (for a history of the CDA, see Congressional Quarterly Almanac, 1992: 557-58). This appears to be evidence of Zaller’s “mainstream” effect: when there is elite consensus, those who are exposed to the message or information and who already have contextual information with which to accept or reject that message or information, will only have one viewpoint to use when forming an opinion. Thus, when asked, a respondent is more likely to recall the consensus opinion when asked about the issue (Zaller, 1992, 1993). In the case of Cuba, the public has a large body of contextual information from which to draw. What was added to the mix in 1992 was the emergence of an elite consensus, namely the agreement of the two men running for the highest office in the United States. They, and their acolytes, each agreed to strengthen U.S. policy mechanisms against the Castro regime and voiced that conclusion in words and actions. Since 1992-93, public opinion has continued to follow that conclusion. Interestingly there were no polls taken on Cuba in 1995, despite the heated Washington debate on which course the policy should take. But in 1996, in April, two months after the shootdown, a Gallup/ CNN/USA Today poll showed 49 percent against “reestablishing U.S. diplomatic relations with Cuba,” 40 percent in favor of such a move, and 11 percent with no opinion (The Gallup Poll: Public Opinion 1996: 65). So two months after the shootdown and enactment of Helms-Burton, there was no dramatic or significant increase in public hostility to normalizing U.S.-Cuban relations. In fact, there was a decrease in opposition to normalization from a level of 59 percent in the Fall of 1994 to 49 percent in April 1996. By 1999, public attitudes had once again reversed themselves, with majorities clearly favoring the normalization of U.S.-Cuban relations. In March 1999, Gallup found 67 percent in favor of normalization, with 27 percent opposed. By May, the number expressing an opinion in support of normalization had risen to 71 percent and opposition at 25 percent. In both the March and May surveys, an attitude shift on normalization was accompanied by one on lifting the embargo: 51 percent now expressed support for the embargo’s lifting, while 42 percent expressed opposition to such a move. In both surveys, respondents continued to express strong negative feelings towards Cuba (see, David W. Moore, “Americans Support Renewed Diplomatic Relations with Cuba,” Gallup News Service, May 24, 1999). Again, this data would tend to confirm the volatility of public attitudes towards Cuba. However, the shift is reasonable given the circumstances of the previous 12 months. In January 1998, the Pope traveled to Cuba, provoking media interest and political/policy debate on the U.S. relationship with Havana, including debate in Congress on the sale of food and agricultural and medical supplies to Cuba. There also emerged a bipartisan coalition of current and former senior foreign policy officials, to create a bipartisan commission to review U.S. policy towards Cuba. These policy debates culminated in January 1999 when President Clinton announced a series of steps to promote “people-to-people” exchanges which are permitted under the Cuban Democracy Act of 1992. Perhaps most significantly for a popular audience, baseball became a focus of U.S.-Cuban relations when both governments approved an exchange of games between the Baltimore Orioles and a Cuban national team. In late March and early May, in Havana and Baltimore, respectively, the U.S.-Cuba relationship was played out (literally) on a baseball diamond. “Beisbol diplomacy” also combined in 1999 with a growing interest by “farm belt” interests and their Members of Congress to expand food and agricultural sales to Cuba. This set of circumstances would suggest further confirmation of Zaller’s “mainstream effect.” It is arguable that pubic opinion has followed the changed tone emanating from Washington about how to approach Cuba, while continuing to hold negative views of the nature of the Cuban system. In discussing the topic of the media and Cuba, one is confronted with as much folklore as fact. The role of the elite media in Cuba policy begins prior to Castro taking power. American interest in Cuba at the turn of this century is attributed to the power of the “yellow journalism” of William Randolph Hearst. Almost 60 years later, the emergence and victory of Castro and his 26th of July Movement has been attributed as much to the New York Times as to the instability and problems of the Batista regime which Castro replaced. What has persisted is the media’s fascination with Castro (see, Ratliff, 1987). He meets Graber’s (1997) criteria for “good copy,” including conflict, familiarity, timeliness, and the novelty of what he will say or what his government will do next. In short, Castro is a good “news peg” upon which to hang a story. During the 1995-1996 time period, events and personalities both in Washington and Havana made “Cuba” an attractive story. One of the first foreign policy legislative initiatives introduced in the new Republican-controlled Congress was the Cuban Liberty and Democratic Solidarity (LIBERTAD) Act (more popularly known as “Helms-Burton”) (for background on Helms-Burton, see Fisk, forthcoming). From the introduction of Helms-Burton until February 23, 1996, the Congress and the Clinton Administration had struggled over two questions: “Who would set Cuba policy?” and “Which direction would that policy take?” President Clinton had publicly expressed reservations about Helms-Burton; Secretary of State Warren Christopher had said that he would recommend a veto; and other Administration officials, led by the State Department, had lobbied the Congress for a year in opposition to the legislation. Yet on March 12, 1996, two weeks after the shootdown, there was a ceremony in the Old Executive Office Building to mark the bill’s signing into law by the President. At first glance, this sequence of events appears reasonable. The shootdown was a tragedy deliberately committed by a regime with which the United States does not have a normal diplomatic and political relationship—the President could not afford to do nothing. He had to respond in some fashion to this act for foreign policy purposes and arguably domestic political purposes, namely to placate Cuban-American voters in Florida and New Jersey. Nineteen ninety- six was an election year, and he needed their votes. But there is another dynamic, closely related to foreign policy and domestic ethnic electoral clout: that was American public opinion. The White House “panic” after the shootdown was as much based on the audacity of the Castro regime’s actions as it was on the political/electoral ramifications if the United States did not adequately respond. And in an election year, it can be difficult to distinguish between actions that are election-driven and those that are more generally aimed at generating positive reaction to the President or his agenda. Former White House and congressional officials agree that the reaction chosen in February 1996— approval of Helms-Burton—need not have been. The day after the shootdown President Clinton condemned the act “in the strongest possible terms” and took a series of unilateral actions (Washington Post, February 25, 1996). Elite opinion, especially that represented in the pages of the New York Times, Washington Post, Los Angeles Times, Chicago Tribune, and St. Louis Post Dispatch, amongst others, denounced the shootdown while continuing to editorialize against Helms-Burton. What public reaction there was came primarily from south Florida and northern New Jersey; general expressions of “public outrage” (such as calls and letters to the White House and Congress) were not of such a magnitude as to cause a rush to do more. Between February 1, 1995 and March 25, 1996, 342 editorials appeared in a total of 97 newspapers. Of these 342 editorials, 210 were printed prior to the shootdown on February 24, 1996, and 132 were run in the four weeks following that event. Editorial opinion against U.S. policy, especially any strengthening of it did not just come from the Times and the Post. The majority of American newspapers opposed U.S. policy. The 211 editorials prior to the shootdown appeared in 67 papers. Of these, 130 expressed opposition to U.S. policy, with 36 in favor, and 44 leaving the reader not sure what to think on the broader question of U.S.-Cuba relations. Following the shootdown, 90 papers expressed some editorial opinion on U.S. policy. In all, 132 editorials appeared after the shootdown, with 80 against U.S. policy, 36 in favor, and 16 vague in their conclusion about the proper course for U.S. policy. The question, however, is not simply one of how many ran and when, but where they ran. For instance, the Chicago Tribune ran eight editorials prior to the shootdown; all expressed opposition to U.S. policy generally and Helms-Burton specifically. In fact, all the 44 “major newspapers” listed by LEXISNEXIS opposed U.S. policy towards Cuba, except for the Atlanta Journal and Constitution (see below), the Boston Herald, the Columbus Dispatch (which supported the embargo, but opposed Helms-Burton), the Dallas Morning News (which favored U.S.- Cuban talks and the embargo, but not Helms-Burton), the Houston Chronicle, the Omaha World Tribune, the Phoenix Gazette, and the Times-Picayune (which favored UN action). The Atlanta Journal and Constitution ran one editorial condemning the shootdown and leaving the reader with the impression that a strong response was required, but then ran another editorial the same day opposing Helms-Burton. In all, the Atlanta paper ran 10 editorials on Cuba, nine of which expressed opposition to U.S. policy. The Miami Herald presents another case. It endorsed a watered-down version of Helms-Burton but had been, for some time prior to 1995, in favor of a loosening of U.S. restrictions, although not a complete lifting of the embargo. According to a poll taken in 1994, the last one taken prior to the shootdown, the American public opposed the reestablishment of normal relations with Cuba. In the first poll taken after the shootdown, 49 percent of the public opposed normalization. The shootdown did not change public opinion or cause an abrupt swing. Editorial opinions by the New York Times, Washington Post, Los Angeles Times, Chicago Tribune, and St. Louis Post Dispatch, amongst others, did not change the broader public perception. One policy option available to the President in late February 1996 was to stick with the limited actions the President had taken the day after the shootdown, while taking the case to the United Nations, which the United States did. The Administration could have then worked its allies on the Hill in an effort to sustain a filibuster in the Senate against anything more than a condemnation of Cuba’s act. And the White House could have attempted all this while standing behind majority elite opinion. That is not what happened, however. So, in the words of one former official, why did the White House “panic”? That former official said the White House felt that the President’s numbers were low in the polls and that anything that contributed to his reelection should be done. Helms-Burton was the toughest item on the “diplomatic list” of options; aerial bombing was the toughest response on the non-diplomatic list. But the military argued that no effective bombing response could be had: Castro would either repair the damage with little trouble or targets were in populated areas and the risk of collateral casualties outweighed the benefits. And apparently the “political types” (namely Chief of Staff Leon Panetta and Communications Director George Stephanopoulos) agreed that signing Helms-Burton was a necessity, despite the objections of other Cabinet members, including the Attorney General, the Secretary of Defense, the Chairman of the Joint Chiefs of Staff, and the Director of Central Intelligence. The Secretary of State was traveling at the time, but he had already expressed his opposition to the legislation. It can be argued that the “political types” remembered outflanking Bush in 1992 and did not want to give such an opportunity to Dole in 1996. That is one reasonable expectation, but the “panic” came from the “policy people” (e.g., NSC staff) and not simply the “political people.” The White House reaction appears to have been the result of complete shock at the nature of Cuba’s actions and a fear of a vigorous general public expression of outrage beyond that to be expected from the Cuban-American communities in south Florida and northern New Jersey. There appears to have been a concern about general public opinion and the fact that the Administration and its congressional allies had no alternative when the crisis came. …I would prefer that we enact something other than this bill. But, Mr. President, that is not an option. … Mr. President, there is no other option before this body for those of us who believe strongly that the United States must respond to Fidel Castro’s latest outrage. Despite its faults, this legislation is the only game in town. For that reason, I will support it (Congressional Record, Daily edition, March 5, 1995: S1493). Thus the element of surprise and shock nullified any gains to be had by using elite opinion as a shield. Elected officials had to anticipate a public reaction (and a potential election opponent), that would hold them responsible and could trace a lack of a substantive U.S. response for the killing of American citizens to specific inaction (or opposition to an action) by those elected officials. Policymakers will respond to their perceptions of mass public reaction/opinion and not on elite opinion, when the mismatch is as significant as it was on Cuba in 1996. Elite opinion does not provide “adequate political cover” when a policymaker anticipates that an act or a failure to act will result in a negative public view of his/her course, be it a vote in Congress or a specific presidential policy. It has been argued that American public opinion, in the aggregate, is stable and subject to changes that are reasonable and reflect the circumstances of the time. This paper was premised on the theory that, given political and policymakers behavior, there was a “Cuba exception” to the stability thesis. It has shown otherwise: that the stability thesis remains valid, even on an issue as intertwined in American politics as Cuba has been since 1959. Despite the unpredictability of the U.S. relationship with Cuba, there is a predictability about American public opinion on that question. Consistent with Page and Shapiro (1992), public opinion towards Cuba is not capricious or wild in its fluctuations; it has gone through periods of stability, with some changes that have a time-specific and issue- specific context (e.g., Cuban troops in Africa in the mid-seventies). What is surprising is that these fluctuations have not necessarily come when logic would dictate. The Mariel crisis and the Reagan Administration focus on Cuba are interesting examples: In both instances, one would think that public opinion would have reflected some hostility to normalization with a regime that was flooding our shores with refugees and sponsoring anti-American revolutions in Central America. In neither instance, however, did public opinion oppose normalization. Yet, in 1992, in the midst of a presidential election, in which “Cuba” was an issue (and more specifically the Cuban- American vote was an issue), but in which there was no action by Cuba to heighten American opposition to the regime in Havana, American public opinion reversed itself. This reversal does not undermine the “stability theory,” because the change in public attitudes from one position to another is understandable given the noise level emanating from two presidential/ elite camps. The data offer several suggestions for policymakers: first, opinion towards Cuba can be influenced by the President (and presidential candidates). Their actions can prompt change, as happened in 1978 in response to Carter Administration concerns about Cuban military involvement in Africa, as well as in 1992 when Bush and Clinton attempted to outflank each other on the Cuba issue. Even when the focus is not directly on Cuba, presidential actions can influence opinions towards that regime. The most dramatic example of this was Nixon’s 1972 trip to China, one consequence of which was to change popular attitudes on the U.S.-Cuban relationship. But this presidential influence is not a certainty, especially when there are countervailing messages from other political influences. An example is that of the Reagan Administration, which spent eight years warning of “another Cuba” in the Western Hemisphere, yet a plurality, if not a majority, of the public continued to favor a normalization of the U.S.-Cuban relationship. Events alone do not change the structure of public opinion, even if they are significant. But the data suggest that presidential initiatives with substantial bipartisan support do have a substantial impact on public attitudes. This is what happened in the early 1970s and again in the early 1990s, even if the specifics of the presidential initiatives are different. Yet, as the Reagan example of the 1980s shows, presidential attempts to shape public opinion without bipartisan support, or with uncertain bipartisan support, seem to have nearly random results: sometimes they affect public opinion briefly and marginally and other times they do not. The data also suggest that policymakers have more freedom of action than appears from their behavior; that they are less restrained than the “conventional wisdom” (even the “conventional wisdom” held by politicians) leads one to believe. If policymakers feel or perceive “pressure,” except in a few instances, it is pressure they exert on themselves. This tracks with the findings of Bauer, Pool, and Dexter (1963) in their study of American business influence on the policy process. They concluded that a “congressman makes his own job and hears what he chooses to hear [a result of which] is that he can be a relatively free man, not the unwilling captive of interest groups or parties” (1963: 421). This is not to deny that policymakers, in particular those subject to electoral approval, may believe that the pressure feels “real” to them. Pressure is how the policymaker sees it, and it is largely within the control of the policymakers to determine how they see it. The data on public opinion towards Cuba confirms the Bauer, Pool, and Dexter conclusion in one foreign policy arena. The data further suggest another aspect of the “Cuba question”: how the issue is framed. If the issue is framed around Castro, then the public response tends to be negative. U.S. public opinion has consistently evidenced a strong dislike of Cuba’s leader, Fidel Castro. This is the one issue upon which one could stand at any one moment and predict a similar outcome at a later time. For an 18 year period (from 1960 until 1978), as measured by Gallup’s “+5”/”-5” (like very much/dislike very much), an average of 68 percent of respondents put Castro in the “-5” (someone you dislike very much) category. This coolness towards Castro personally continues: In the biennial survey on public opinion and foreign policy sponsored by the Chicago Council on Foreign Relations (CCFR), Castro has continued to be at the cool end of the feeling thermometer. For example, in the 1986 survey, the mean thermometer reading for Castro was 20 degrees. In the 1998 survey, the mean was 23 degrees, with Castro only ahead of Saddam Hussein (12 degrees) in the chill respondents felt towards these world leaders (Reilly, 1987, 1991, 1995, and 1999). Attempts to frame the issue around “immigration,” on the other hand, have had little impact. The issue of Cuban refugees does not appear to have a direct connection in the public’s mind with the broader question of U.S. policy towards Cuba. The question of immigration impacts the public’s attitude towards the President’s job performance, but it does not appear to impact opinion on the proper policy course the United States should follow towards Cuba. But the data suggests something even more significant about U.S. policy: that policy-makers cannot necessarily anticipate when they will be the beneficiaries of opinion stability or its victim. Elite opinion is not a good barometer of the mass public’s view, nor is it a leader of the public’s attitudes in the case of Cuba. More importantly, it appears that elite opinion is not a sufficient shield from public opinion should policymakers, especially elected officials, make decisions which appear contrary to where the mass public is on this issue. As for general public opinion, the February 1996 shootdown did not cause an abrupt change in the public’s attitude towards Cuba. The shootdown appears to have reinforced already existing public attitudes, but it did not increase negative feelings towards normalization. Nor did that event cause a change in elite opinion as to the proper course for U.S. policy; elite media opinion still favored direct engagement with the Cuban regime. In comparing the responses to public opinion polls with positions taken in editorials, it is clear that, in the Cuba case, public opinion did not/has not followed elite media opinion on Cuba in the 1990s. I make no attempt to generalize these findings beyond Cuba. Arguably foreign policy is case specific, in terms of how both policymakers and the public see it. What is interesting about Cuba is the length of the “case history,” which is now 40 years in the making. In this case, public opinion does not necessarily follow elite media opinion, nor does elite media opinion give the policymaker any guidance as to broader public attitudes. Nor are policymakers necessarily restrained by public opinion should they choose a different policy course. In the final analysis, public opinion on Cuba is stable and, if there is an “instability factor” in U.S.-Cuba relations it is in policymaker behavior and leadership. 1. The author wishes to thank Kim Kahn, Patrick Kenney, Jorge Domínguez, Philip Brenner, René Pérez-López, and Fernando Socorro for their comments on earlier drafts of this paper. 2. For discussions of congressional Democrat fears of being “soft on Communism” or “losing Central America to Communism” see Cynthia Arnson, 1989, Crossroads: Congress, the Reagan Administration, and Central America, New York: Pantheon Books (chapters six and seven); and John M. Barry, 1989, The Ambition and the Power: The Fall of Jim Wright: A True Story of Washington, New York: Viking. 3. These questions come from the Gallup Organization and the American Institute of Public Opinion (AIPO); Louis Harris and Associates; the biennial survey conducted by the Chicago Council on Foreign Relations by Gallup; the 1988 “Americans Talk Security” surveys conducted by Market Opinion Research, Marttila and Kiley, The Daniel Yankelovich Group, and the Public Agenda Foundation; Roper Organization; Yankelovich, Skelly and White; ABC News/Louis Harris and Associates; ABC News/Washington Post; CBS News/New York Times; NBC News/Associated Press; Potomac Associates; Wirthlin Worldwide; the polls of The Daniel Yankelovich Group not connected with the “Americans Talk Security” project; and the Opinion Research Corporation’s polling for Richard Nixon while he was president. I have not used polls which survey only Florida residents or Cuban-Americans. 4. The idea of looking at editorials as an indicator of elite opinion came from Benjamin Page, 1996, Who Deliberates? 5. In a follow-up discussion, this same person acknowledged that their office had been compiling a book of local newspaper editorials on a state-by-state basis for circulation during any further congressional debate on Cuba policy. This opponent of the policy, representing a well-established Hill tradition of circulating editorial opinion amongst congressional offices as part of the political/legislative process, believed that the weight of editorial opinion, when compiled on a state-by-state basis and combined with the views of the “elite newspapers,” would sway members of Congress against Helms-Burton. The project, however, was overtaken by the shootdown. 6. What is interesting is that, as far as I could determine, this question was only asked once. My speculation is that it became clear within the first few years that Castro had no intention of attacking Guantanamo, so there was no reason to pursue public opinion on that question. 7. Public opinion was critical of President Carter’s handling of the Cuban refugee situation. During the Summer of 1980, majorities ranging from 65 to 83 percent expressed disapproval of his handling of that situation (see, CBS News/New York Times, June 26, 1980 (USCBSNYT.062680.R31); ABC News/Louis Harris and Associates, July 30, 1980 (USABCHS.073080.R2D); and ABC News/Louis Harris, August 26, 1980 (USABCHS.082680.R2I)). 8. For a discussion of general public opinion on Central America, see Sobel (1993). 9. See Alvin Richman, 1991, “Changing American Attitudes Toward the Soviet Union,” Public Opinion Quarterly 55: 135-48. 10. There appears not to have been a “rally effect” or surge of general public support for the President during a foreign policy crisis. Further, there was no attempt by the White House to set the tone or otherwise lead American opinion on the shootdown and the President’s unilateral response. Another aspect of the shootdown is that there was no “CNN effect” as there were no dramatic pictures or onthe- spot reports.